That’s how the MedFest idea was born and for 15 years has enabled thousands of Special Olympics athletes in Chicago to keep their medical applications up to date. United Center donates the space and Advocate Medical Group provides the more than 100 physicians and clinical and non-clinical staff. They are supplemented by a group of volunteers from the United Center, GE and other groups. 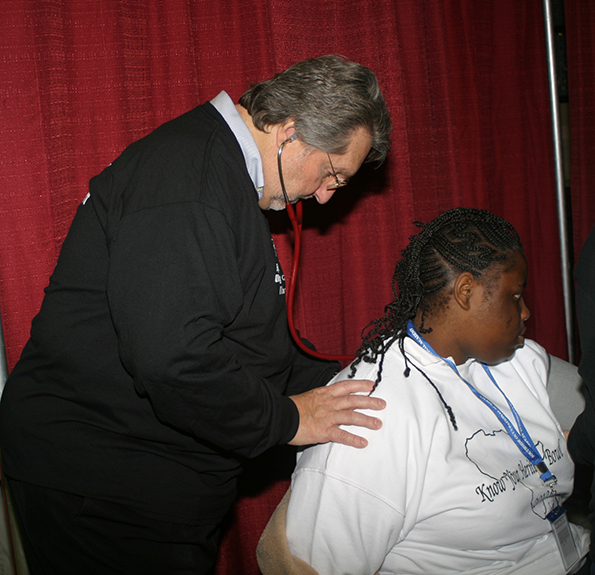 Dr. Rick Bones examines a Chicago athlete at the 2012 MedFest at the United Center. Pipe and drape partitions are set up for a series of “examining” stations in the corridor of Chicago’s United Center, home of the Chicago Blackhawks and the Chicago Bulls. 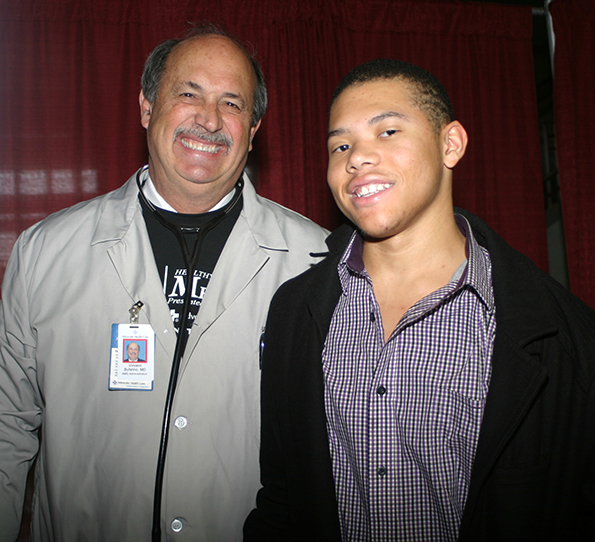 Dr. Rick Bone became the point person from Advocate at the beginning and he is still the Clinical Director for MedFest. “The doctors and staff of Advocate look forward to this event each year and the interaction they’re able to have with the athletes,” Dr. Bone said. And how about the athletes? Most of the athletes are from the Chicago Public Schools. MedFest gives them a chance to see the inside of United Center where the Bulls and Hawks play. In fact, the Chicago Blackhawks are often practicing when the athletes are sitting in the arena waiting for their turn to go through the cycle at MedFest. Their visit includes not just the medical exam, but a chance to have their eyes examined free at the Special Olympics Opening Eyes area (sponsored by Lions Clubs International) where they’ll receive free glasses if needed. They also enjoy a box lunch and receive a goodie bag to take home. The 15th annual Chicago MedFest takes place on Nov. 13 and is supported by Blue Cross and Blue Shield of Illinois, GE, Advocate Medical Group and United Center. Nearly 1,500 athletes are expected to be processed that day. The Chicago MedFest has become a model for Special Olympics MedFests that now take place at locations around the world.